This is version number 2 of this great old tune, this time in the key of D and in dropped-D tuning, my personal favorite. It's basically the same arrangement, but in a new key. Here it is in the key of G.
First things first, let's tune to Dropped-D: lower the pitch of the bass string by a whole tone, from E down to D. The easiest way to do that is to twang the D string while you're twanging and lowering the E string. You'll soon hear the two notes converging and merging. The bass string will be an octave below the D string, but when both notes are D, you'll hear the throbbing and pulsing between the two stop. You should then check the other strings as well because the release of tension can sometimes affect their tuning. This is where an electronic tuner really comes in handy. You're never going to sound good no matter how well you play if your guitar is even slightly out of tune. 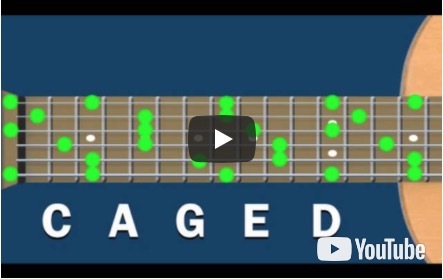 This version in D is a lot trickier than the one in G. You'll quickly see in the video that there are some fairly big moves up and down the fretboard. Trust your fretboard markers! I certainly do. You will eventually get to the stage where you can play with your eyes closed, no matter where the arrangement takes you, but until you can, keep referring to the markers. I didn't include the chord diagrams in the tab ... the chord shapes I'm working off are less obvious in this key, and there are so many chord changes that I wouldn't have had enough room for them all. I have indicated most of the chord names, however. I say most because there are a couple of passages where each beat is in effect a new chord and it seemed silly to write them all in. Those that are there would be the chords a friend could strum while you're playing the picking part. The barred Bm7 up the neck is probably the trickiest bit to play cleanly, other than that, there's nothing too difficult. I think the hardest thing about this arrangement will be piecing all the little moves together that make up the tune. This becomes much easier to do when you can see the whole fretboard laid out as 'the chord of the moment', as I call it. Because music does keep working around whatever chord is in play right now, it makes sense to be able to see the entire fretboard as that chord, not just one or two positions. 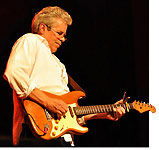 Then all those big moves up and down the fretboard make perfect sense and are just as solidly locked in as any of the well known open chord shapes. My book Planetalk teaches a very simple way to do that. There's an interesting Cmaj7 at measure 5, the root (the 1) is on the bass strings way up at the 10th fret (because we're in dropped D) and the rest of the chord is the three open treble strings, which are the 5-7-3. Together they spell out 1-3-5-7, a major 7th chord. You'll hear that I did the chorus section an octave lower than you would expect. In D, the whole thing took place way up the neck and it seemed like a bad idea. It only takes my ear a second or two to adjust to the lower octave, I think it works well and it's much easier to get the fingers around. There are some good stretches in this lesson. Dropped D is great for opening up the hand. Because the bass string is down a tone, all the bass notes on that string need to be two frets higher than normal, making some chords, like the A/G quite a reach. If at first it seems impossible, don't worry. Just keep working at it and I promise that those tendons and sinews will lengthen and that you'll be able to grab them soon enough. We all go through it, sometimes it takes a few too many days to get there, but it will be second nature to you as long as you keep working at it. As always, take it one chunk at a time. Work out a small section -- get it right -- then add the next small section and play both until they're right. Keep adding new bits until you've committed the whole tune to muscle memory. Then, you need to play the whole thing over and over until it all flows and becomes music. You can the inject your own dynamics as your mood dictates. You can hear how my version keeps slowing down, speeding up, lingering here and there. Solo guitar pieces need not be metro-nomically precise, sometimes to get the emotion and feel into the piece, you want to stretch and compress the tempo here and there.